We had our company's national sales meeting down in Jacksonville this week. Between all the presentations and meetings, I was dependent on Metsblog and Hot Foot to keep me up do date on Metsdoings. I returned back Wednesday afternoon, and promptly headed to the UNCG campus, where I have started taking graduate school classes. I'm taking classes two nights a week, for three hours at a time. If all that weren't enough, I have a last-minute trip to Chicago next week as well. This is interfering greatly with my ability to follow the Mets! Due to my ridiculously hectic schedule, I've not seen, among other things, either of Dave Williams starts, Shawn Green in a Mets uniform, or even Guillermo Mota pitch. Now, I am not giving up on blogging on this site, but I have to be honest with my readers (both of you) and admit that my perspective on the Mets is based more and more on what I read on other blogsites (thank you Mets Guy In Michigan, Metstradamus, Toasty Joe, The Metropolitans, et al), and ESPN.com than what I see with my own eyes. Now if you'll excuse me, I have to take a nap. By the way, the Mets swept the Cardinals out of Shea Stadium yesterday, while sending down Lastings Milledge and Ricky Ledee, trading for Formerly Transplanted ex-met Kelly Stinnet, and placing Ramon Castro on the 60 day disabled list. Omar might be as tired as I am! While my company was having it's national sales meeting down here in Jacksonville, the Mets were staging a performance for the season's highlight reel with a comeback win against a probable postseaon opponent. Down 7-1 against the St. Louis Cardinals, the Mets came back to win 8-7, thanks to a grand salami by Carlos Delgado and a walk-off homer by Carlos Beltran off transplanted ex-met Jason Isringhausen. Newly acquired former Piazza nemesis Guillermo Mota pitched a scoreless inning in the win. 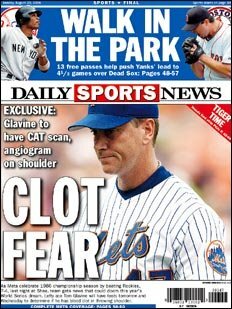 Even better news for the day was the fate of Tom Glavine, who not only is not lost for the year, but may pitch as early as next week. Mets Magic Number is now 25. I'm up early this morning, off to the airport for yet another business trip, but I stopped by the trusty computer to type a few words about last night's Magical reunion and win over the Rockies. What the online version of the Daily News gave me instead was this. Nice way to start a trip, huh?